GA aircraft and turboprop commuter-type aircraft often use a pneumatic deicing system to break off ice after it has formed on the leading edge surfaces. The leading edges of the wings and stabilizers have inflatable boots attached to them. The boots expand when inflated by pneumatic pressure, which breaks away ice accumulated on the boot. Most boots are inflated for 6 to 8 seconds. They are deflated by vacuum suction. The vacuum is continuously applied to hold the boots tightly against the aircraft while not in use. The source of operating air for deice boot systems varies with the type of powerplant installed on the aircraft. Reciprocating engine aircraft typically use a dedicated engine-driven air pump mounted on the accessory drive gear box of the engine. The suction side of the pump is used to operate the gyroscopic instruments installed on the aircraft. It is also used to hold the deice boots tight to the aircraft when they are not inflated. The pressure side of the pump supplies air to inflate the deice boots, which breaks up ice that has formed on the wing and stabilizer leading edges. The pump operates continuously. Valves, regulators, and switches in the cockpit are used to control the flow of source air to the system. The source of deice boot operating air on turbine engine aircraft is typically bleed air from the engine compressor(s). A relatively low volume of air on an intermittent basis is required to operate the boots. This has little effect on engine power enabling use of bleed air instead of adding a separate engine-driven air pump. Valves controlled by switches in the cockpit deliver air to the boots when requested. GA aircraft, especially twin-engine models, are commonly equipped with pneumatic deicer systems. Rubber boots are attached with glue to the leading edges of the wings and stabilizers. These boots have a series of inflatable tubes. During operation, the tubes are inflated and deflated in an alternating cycle. [Figure 1] This inflation and deflation causes the ice to crack and break off. The ice is then carried away by the airstream. Boots used in GA aircraft typically inflate and deflate along the length of the wing. 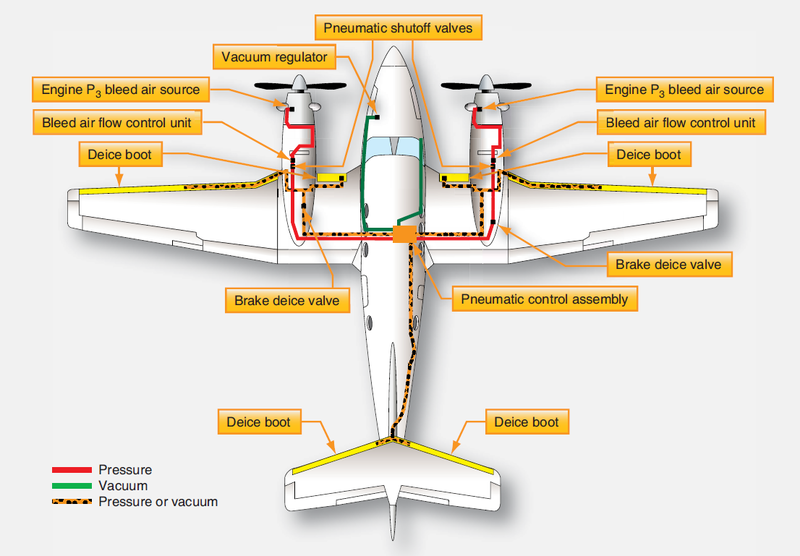 In larger turbo prop aircraft, the boots are installed in sections along the wing with the different sections operating alternately and symmetrically about the fuselage. 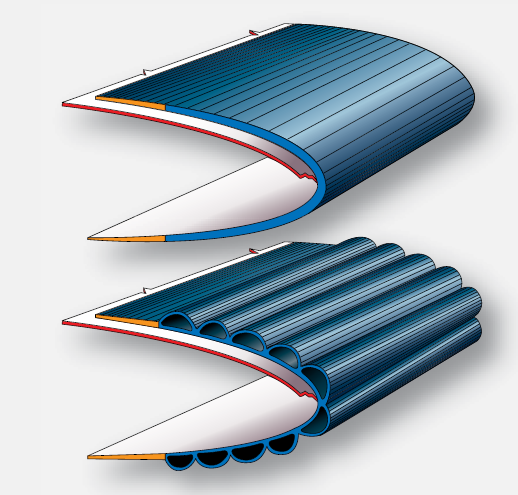 This is done so that any disturbance to airflow caused by an inflated tube is kept to a minimum by inflating only short sections on each wing at a time. 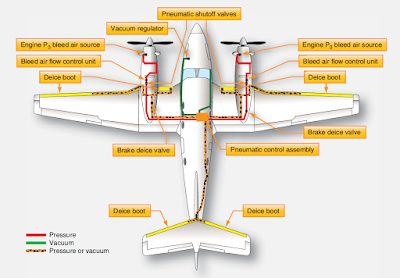 Figure 2 shows a deice system used on a GA twin-engine aircraft with reciprocating engines. In normal flight, all of the components in the deice system are de-energized. Discharge air from the dry air pumps is dumped overboard through the deice control valves. The deflate valve is open connecting the deice boots to the suction side of the pump through the check valve manifold and the vacuum regulator. The gyroscopic instruments are also connected to the vacuum side of the dry air pump. The vacuum regulator is set to supply the optimum suction for the gyros, which is sufficient to hold the boots tightly against the airfoil surfaces. When the switch shown in Figure 3 is pushed ON, the solenoid-operated deice control valves in each nacelle open and the deflate valve energizes and closes. Pressurized air from the discharge side of the pumps is routed through the control valves to the deice boot. When the system reaches 17 psi, pressure switches located on the deflate valve de-energize the deice control valve solenoids. The valves close and route pump air output overboard. The deflate valve opens and the boots are again connected to vacuum. 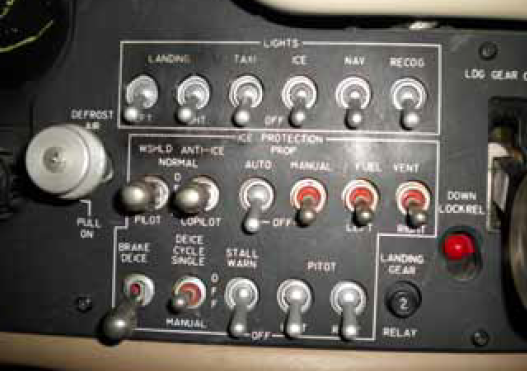 On this simple system, the pilot must manually start this inflation/deflation cycle by pushing the switch each time deice is required. 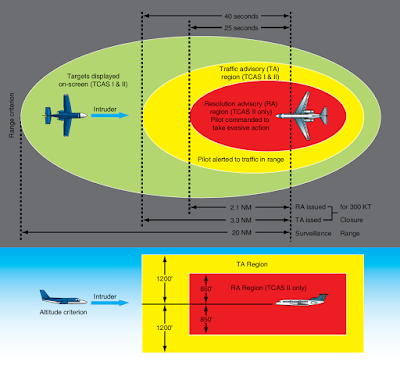 Larger aircraft with more complex systems may include a timer, which will cycle the system automatically until turned OFF. The use of distributor valves is also common. A distributor valve is a multi-position control valve controlled by the timer. It routes air to different deice boots in a sequence that minimizes aerodynamic disturbances as the ice breaks of the aircraft. Boots are inflated symmetrically on each side of the fuselage to maintain control in flight while deicing occurs. 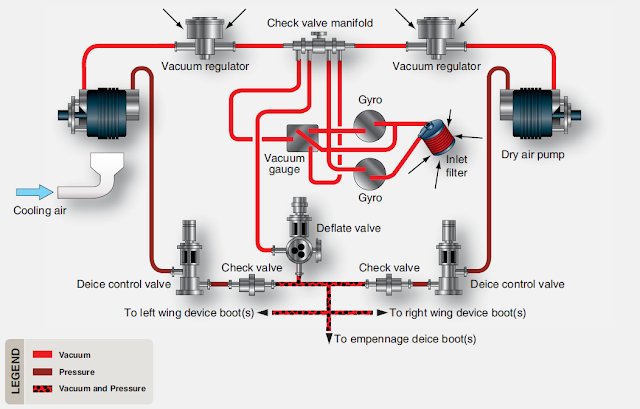 Distributor valves are solenoid operated and incorporate the deflate valve function to reconnect the deice boots with the vacuum side of the pump after all have been inflated. Combining functional components of a deice system into a single unit is fairly common. Figure 4 illustrates the right side of a large aircraft deice boot system. The left side is the same. In addition to the distributor valves, which combine functions of a control valve and deflate valve, the system also uses a combination unit. This unit combines the functions of a shutoff control valve for all pump supply air, as well as a pressure regulator for the system. It also contains a secondary air filter. Figure 5 shows a pneumatic deice system used on a turboprop aircraft. The source of pneumatic air is engine bleed air, which is used to inflate two inboard wing boots, two outboard boots, and horizontal stabilizer boots. Additional bleed air is routed through the brake deice valve to the brakes. A three-position switch controls the operation of the boots. This switch is spring loaded to the center OFF position. When ice has accumulated, the switch should be selected to the single-cycle (up) position and released. [Figure 6] Pressure-regulated bleed air from the engine compressors supply air through bleed air flow control units and pneumatic shutoff valves to a pneumatic control assembly that inflates the wing boots. After an inflation period of 6 seconds, an electronic timer switches the distributor in the control assembly to deflate the wing boots, and a 4-second inflation begins in the horizontal stabilizer boots. After these boots have been inflated and deflated, the cycle is complete, and all boots are again held down tightly against the wings and horizontal stabilizer by vacuum. The spring-loaded switch must be selected up again for another cycle to occur. Each engine supplies a common bleed air manifold. To ensure the operation of the system, if one engine is inoperative, a flow control unit with check valve is incorporated in the bleed air line from each engine to prevent the loss of pressure through the compressor of the inoperative engine. If the boots fail to function sequentially, they may be operated manually by selecting the DOWN position of the same deice cycle switch. Depressing and holding it in the manual DOWN position inflates all the boots simultaneously. When the switch is released, it returns to the (spring-loaded) off position, and each boot is deflated and held by vacuum. When operated manually, the boot should not be left inflated for more than 7 to 10 seconds, as a new layer of ice may begin to form on the expanded boots and become un-removable. If one engine is inoperative, the loss of its pneumatic pressure does not affect boot operation. Electric power to the boot system is required to inflate the boots in either single-cycle or manual operation. When electric power is lost, the vacuum holds the boots tightly against the leading edge. Figure 7. Deicing boots inflated (left) and deflated (right). On modern aircraft, the deicer boots are bonded with an adhesive to the leading edge of wing and tail surfaces. The trailing edges of this type boot are tapered to provide a smooth airfoil. Elimination of fairing strips, screws, and rivnuts used on older types of deicing boots reduces the weight of the deice system. The deicer boot air cells are connected to system pressure and vacuum lines by non-kinking flexible hose. When gluing the deice boots to the leading edge of wings and stabilizers, the manufacturer’s instruction must be strictly followed. The glue is typically a contact cement normally spread on both the airfoil and the boot and allowed to become tacky before mating the surfaces. Clean, paint-free surfaces are required for the glue to adhere properly. Removal of old boots is performed by re-softening the cement with solvent. 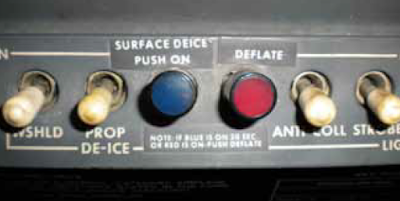 A few modern aircraft are equipped with electric deice boots on wing sections or on the horizontal stabilizer. These boots contain electric heating elements which are bonded to the leading edges similarly to pneumatic deice boots. When activated, the boots heat up and melt the ice off of leading edge surfaces. 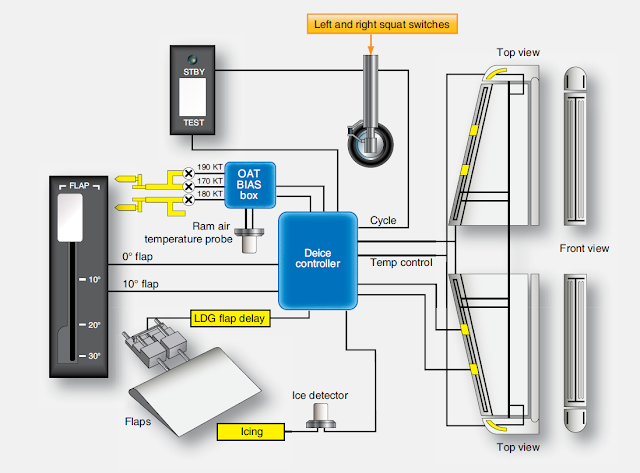 The elements are controlled by a sequence timer in a deice controller. Ice detector and ram air temperature probe inputs initiate operation when other flight condition parameters exist. The boot elements turn ON and OFF in paired sections to avoid aerodynamic imbalance. The system is inoperative while the aircraft is on the ground. Figure 8 illustrated such a system. 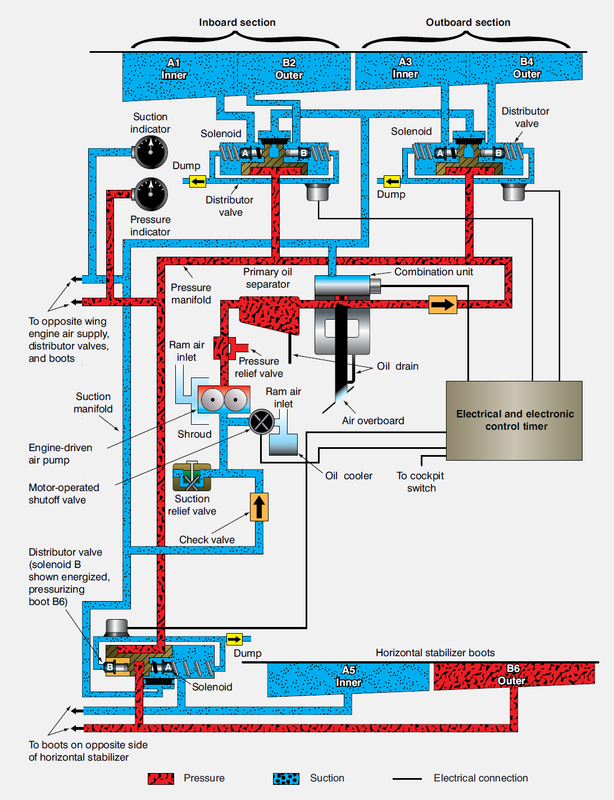 A benefit of electric deice boots is the conservation of engine bleed air. Current draw is limited to only those periods when de-ice is required.